Post news Report RSS	Dev. Diary #2 Meet the Humans! In this article, we will show you the human characters of the game, some early videos from playing as the humans, as well as a more complete description of the gameplay. 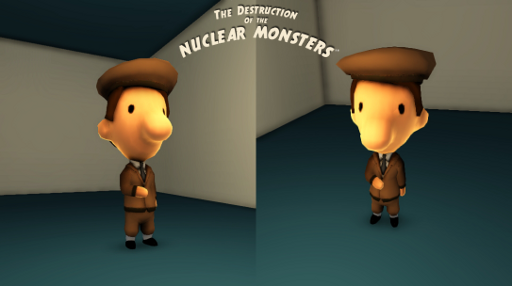 This is the second Development Diary of "The Destruction of the Nuclear Monsters", and we want to share with you many new things that we have done in the past week. Since the beggining of the development of this game, we knew we were not going for ultra realism. We wanted a fun fighting game, fast paced, and with epic destruction levels, but we also wanted to keep our designs with a uique style. Honoring the old classics, while putting our own spin on it. So, with that goal in mind, we designed what we like to call Irreverent Software's "Hugeheads". 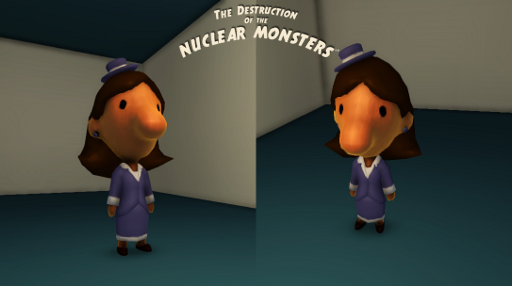 While designing the human characters, we decided to make them fit into a world with semi-realistic buildings and vehicles, but also with the stylized monsters. We took a lot of references from many real life attires from the 30's, and while these are just a few examples, we actually made dozens of variations on these tiny characters, as part of large crowds, and some of them as playable characters for the Human campaign of the game. 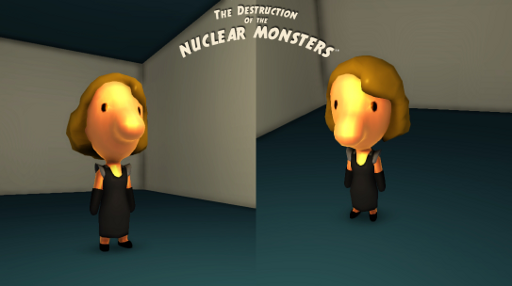 Because that is another news : The Destruction of the Nuclear Monsters features two main campaigns, the monster campaign (playing as one of the six monsters, with different stories) or the humans campaign, fighting to defend Atomvile. Most concepts start as some basic drafts, in 2D. Like a storyboard. They help us to visualize our ideas better, and translate them more easily into the game. But how exactly will this play out? The game has both a single player and multiplayer modes. 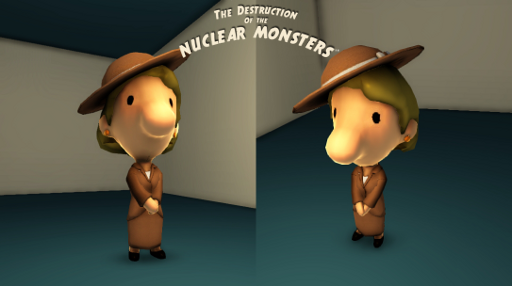 In the campaign mode you will follow the story of the attack on Atomville from the perspective of the human side (through many different characters and objective based missions) or through the eyes of one of the six monsters, each one with its own story. In multiplayer games, you can fight in different matchtypes. The standard monster brawler, that let's you fight against up to 3 friends, each one as a giant monster. The humans vs monsters game, that puts a team of up to five players against one monster. Monster teams : the same as the brawler but by teams of 2. Total destruction : The objective of the game is to destroy more than your opponents before the time runs out. Team destruction : The same as above, but in teams. Defenders : One team of monsters tries to defend specific objectives, while the other team tries to destroy them. The gameplay as the humans is based on class upgrades. The more points you get either by damaging the monsters (military units) or surviving long enough(civilian units) while completing different objectives, the bigger and stronger weapons you get to use. Get enough points, and you will get to use tanks, airplanes, ships, order missile and air strikes, or control the HADES giant robot to defend the citizens of Atomville. 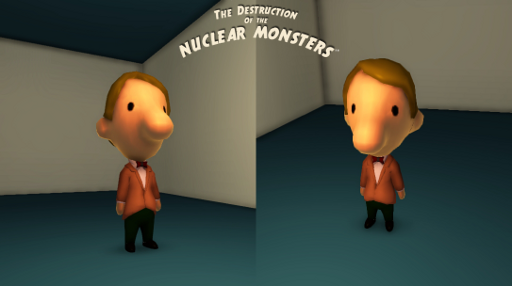 As a monster, you will need to either destroy (Bad monsters) or stand nearby (Defender monsters) certain buildings to get powerups, and restore your health. All this, trying to provide a balanced and fun experience where anyone, even the tiny humans, can win a match. It will all depend on your skills! That's all for this new article, and the next big update, later this week, will be a small interactive demo and proof of concept, showcasing some of the features of the gamefor you to try them out. We hope you will like it! Remember that if you want to know the latest news about our game, you can track it here or follow us on Twitter (@IrrSoft). 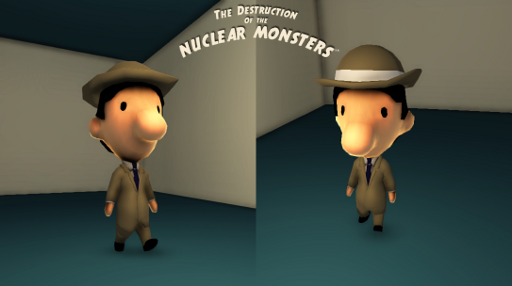 We update this post daily, with many news, and post new screenshots and videos several times a day on Twitter, under the hashtag #NuclearMonsters. Your comments and feedback are very important, and we always reply to them. You can write below any thoughts or questions you have about our game, or reach us through Twitter. Thank you for reading, and till next week! It has been kind of a very long work, with so many animations for each character. Still, many more to do!